Another way to get the FTSE100 dividend yield is to look it up in the FT, at least on Saturdays. langley59 wrote: I agree however that the political situation around Brexit and the consequent strength/weakness of the pound are driving sentiment and this has the potential to override everything else. How to call that is anyone's guess. Further to my earlier point, looking back to June 2016 when we had the shock to the markets of the Brexit vote the immediate consequences were a fall in the pound and a rise in the FTSE. It looks like T. May's Brexit plan is likely to be voted down in parliament on December 11th so might we expect a similar reaction from the markets, ie. a fall in the pound with a rise in the FTSE 100? I find these useful reminders of past resistance levels for the two major tops in 1999/2000 and 2007/2008 for the FTSE 100 in the range 6000 and 6500. In both cases the index has now broken below the 200 dma. It’s worth noting that in 2009 the MACD fell below -400. 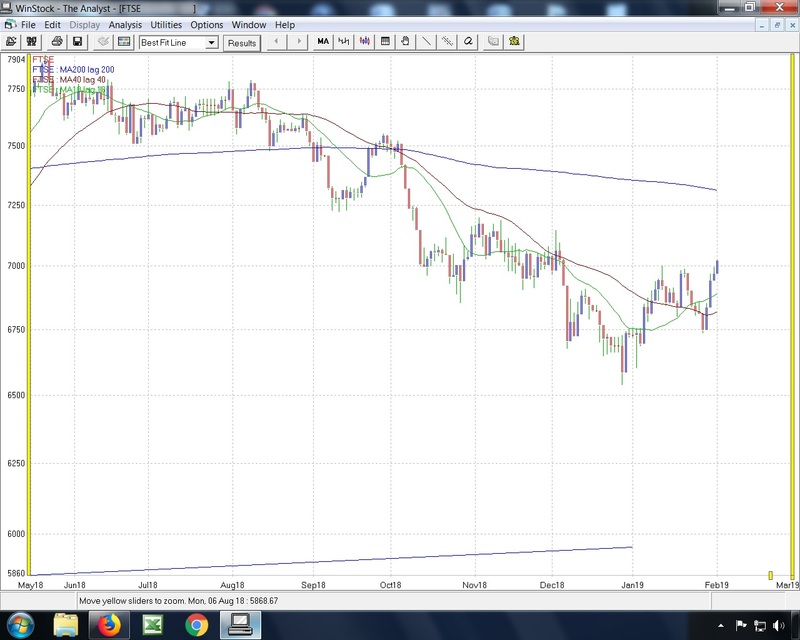 This shows the low at 6900 in August; the effort in November to consolidate around the 7000 mark, and then the latest sharp decline with the 50 dma (just above 6900) well below the 200 dma (around 7350). Interestingly the RSI is not far below 50 (so nowhere oversold) and the MACD is around -90 (compared to -400 in 2009). The index will have to break up through the November consolidation – now resistance - around 7000, as well as the 50 dma and then the 200 dma. So historically, the FTSE 100 is back in familiar territory. Arguably, the historical high range of 6000 to 6500 (above) needs give significant support (if tested). Otherwise, perhaps the index is in danger of entering a new range from 5000 to 7000 (per the ten-year chart). I leave others to give more informed/expert suggestions as to the likely way ahead. Great start to the year - should of course read "2019". Not that I expect many folk to read my occasional and amateurish musings, which are often off target. I have clean forgotten (and can’t find via searching) the symbol for the FTSE 100 for its chart on StockCharts - stockcharts.com. I’ll much appreciate this info. Well, here's an odd thing: the FTSE 100 is looking quite chipper at the beginning of February. I really expected some worse things to come - and of course, there may well be a slump - although my downside target set last August was not only reached but exceeded. However, I have a nice Delphi signal plus an upside target on Point and Figure of around 7600 has just been triggered. There are also lows trending up on the RSI which helps - but the flies in the ointment are: the Coppock is still firmly down, and the upside target on the P and F is in the context of being underneath the 45 degree down trend. That tells us the general downrtend is still in force, also confirmed by usual line chart. Some hope, then, but hardly time to break open the champagne. Arborbridge wrote: Well, here's an odd thing: the FTSE 100 is looking quite chipper at the beginning of February. I really expected some worse things to come - and of course, there may well be a slump - although my downside target set last August was not only reached but exceeded. Very interesting post Arb. Do you have a link to the p & f chart? Not very expertly cut and pasted, but you can see that the final column on the right breaks out above column of "0"s, just above the 7000 level. The box size is 60 points, with 3 box reversal. "2" on the column marks the month number - i.e. February. With all the bad news around, seeing this tentative change of direction is a surprise. 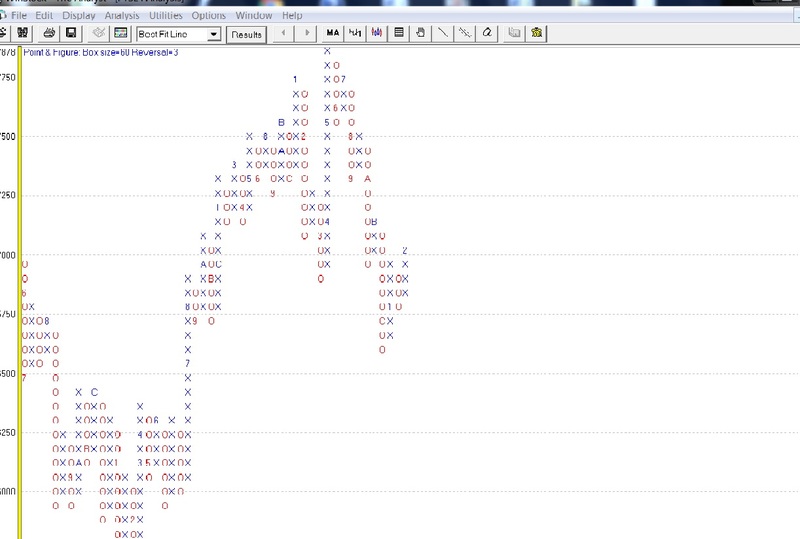 My interest here is the perfect Delphi signal at the end, which corresponds with the P and F breakout. Delphi occurs when the 20 day line crosses over the 40 day, and then the market price drops below and back up again in a whipsaw. It's usually more effective if it happens within a month or less of the cross, which it has. We are still well below the 200 day line, which is also still trending down. If one was using Delphi, buys would have been placed for when the price came back above the 20 day, with a stoploss under the 40 day. Delphi is also said to work in the negative sense, from the downward crossover. Like all these things, it's fun and an "indication" rather than gospel. Approach purely in the spirit of a curiosity, and that you win some and lose some!